Salita Serbelloni is one of the prettiest, more photographed streets in Bellagio, and here is where this establishment sells the finest silk accessories imaginable. All their silk items-scarves, ties, foulards and bag–are homemade. Additionally, they also sell men’s clothing and leathers. The designs and makes are all classic, and of wonderful quality and color. And the staff is wonderfully helpful. How popular is Azalea-silk Of Como? People normally club together The Garden Of Villa Melzi Or I Giardini Di Villa Melzi and Profumeria Bellagio while planning their visit to Azalea-silk Of Como. Very helpful. 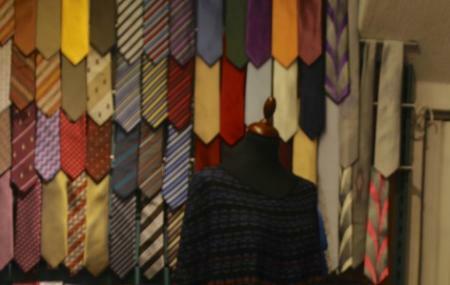 Massive selection of silk scarf and ties. The shop is delightful, the service par excellence. Something for everyone. Azalea di Luca Gandola is most charming. Locally made and stitched by hand, these are beautiful silk or cashmere scarfs. They are also not very expensive since you are only paying for the quality and not the name as you would with the name brand stuff. The service was excellent, willing to show you anything you want. Beautiful silk scarfs ties etc. All hand made in Como.